Maple Ridge/Pitt Meadows Cyclist: Development along 123 bike route: cyclists don't matter, again? Development along 123 bike route: cyclists don't matter, again? At the Council meeting on Nov 25 (starts at about 57 minute mark), the following development application was discussed by (outgoing) Council: 2013-041-RZ, 20738 123 Avenue. This is on the 123 bike route. "3. The existing 123 Avenue is narrow along the development site, which results in speeding and is a concern for cyclists." "3. The Engineering Department is in support of maintaining the existing road right-of-way width on 123 Avenue although it is less that the standard for a collector road. A Development Variance Permit is required. The narrower road right-of-way is to reduce the impact on McKenney Creek, which has two tributaries that cross 123 Avenue in this location." I appreciate that the reason for not widening 123 Ave. in this location is to reduce the impact on McKenney Creek. However, the substandard width means significant safety issues for cyclists (of all ages and abilities), especially as car traffic increases significantly in the coming years. I would like to point out that 123 Ave. is not only a major corridor for car traffic, but it is also one of the few east-west corridors for cyclists. It is, in fact, the only east-west bike route north of Lougheed between Skillen and 206th Streets and as such cannot reasonably be avoided. 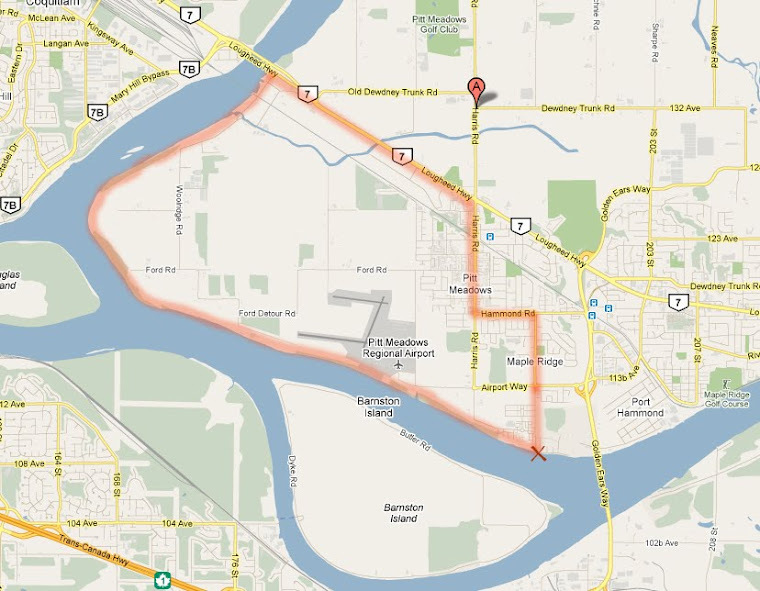 The only other east-west neighbourhood bikeway is the 117th route south of Lougheed. 123 Ave. is not a local street, so actually it's not really a "neighbourhood bikeway". It's a major collector road (according to the Transportation Plan), so it is a "shared use lane". Traffic calming can not be used to slow traffic. As explained above, a "shared use lane" should be minimum 4.3 metres wide. The lane presently is too narrow for a shared use lane (I believe it's about 3.3 metres) - definitely too narrow for a car/truck to safely pass within the lane. That means that the safest thing for cyclists to do would be to "take the lane" ride in the middle of the lane), to ensure that drivers can only pass by moving into the oncoming lane. cyclists may or may not be required to take the lane in this case to ensure their own safety (again, the Motor Vehicle Act is not conclusive here, but I know a judge in one case decided that a cyclist was at fault for NOT taking the lane to ensure his own safety); .....in other words: the cyclist can be found at fault in either case. It is also a practice that many cyclists will not feel comfortable doing on a road like 123 Ave. It is also a practice which tends to infuriate some drivers, possibly resulting in road rage and at least terrified cyclists, and potentially catastrophic consequences. East-west traffic is expected to increase by 100% in west Maple Ridge over the next 20 years, and with that, potential conflict between cyclists and drivers will increase. We're not just planning for the present, we're planning for the future. I believe it's important to adhere to the minimum road width of 4.3 metres in this case, to ensure adequate safety for cyclists and to reduce the very real potential for road rage." Note that Coun. Bell and Coun. Masse brought up some of my concerns during the meeting. Coun. Bell asked about the actual impact that widening the road would have on the creek. I think the development itself, the impact of the 21 homes, the road, parking and driveways that will be built as part of this development between the two creeks is way bigger than the widening of the road. During this same meeting, Council approved a development of 91 1-acre luxury homes on pristine land with various creeks running through it north of Dewdney at 269th Street . Coun. Bell voted against. Why no concern from the rest of council about the impact on the environment in this case, and widening a short stretch of road to ensure the safety of cyclists cannot be done? Staff report on this development application, dated November 17, 2014, can be found attached to the Council agenda of November 25 on page 190. Update: Link for public hearing Dec. 9: http://media.mapleridge.ca/Mediasite/Play/c894c473caeb49e8a6fad89f111397251d. Several comments were received by Council from cyclists. Presentation by city planner Chuck Goddard starts at 32:00. Speakers comments start at 38:00. 123 Ave. starts at 20:00. I'm really happy that Council is listening to cyclists' concerns! We'll have to wait and see what staff will bring back to council in January.